The temperature of your aquarium needs to be set according to the fish type you have in it. Tropical and Marine Fish require temperatures of about 78 degrees or higher (82 degrees for discus). To achieve these higher temperatures and sustain them in an aquarium, heaters are used. Aquarium heaters have a variety of features and elements that help them function. It is important to know that the temperature within an aquarium should only ever fluctuate 1-2 degrees in a 24 hr period, so make sure the heater you choose is reliable. For choosing the best heater that suits your aquarium, there are a lot of models in the market with different features and specifications. The list below has the test top aquarium heaters on the market right now. All of these heaters are manufactured to deliver performance, durability, and impressive heating capacity. The best possible pick out of all these great options would be the Aqueon Pro Adjustable Heater. Its better heating capacity, safety features, and accurate temperature reading ensures a happy purchase for a long time. What to look for in Aquarium Heater? 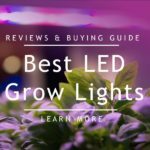 If you’re wondering what the best aquarium heaters are, here are 5 of the highest rated and best-selling ones on Amazon. Below the table is also more information on each product. Note: All Heater are Fully Submersible and have a thermostat. The list is compiled for Best Value and Top Rated heaters available online based on deep product research and customers’ feedback. 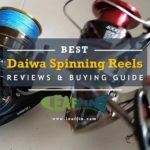 Click on one of the featured products and you’ll be brought to Amazon’s product page, where you’ll find genuine customer reviews which we recommend you to read. 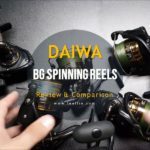 Its highest rating can be attributed to its almost indestructible construction thanks to its aluminum core (does not use any glass components) that provides strength and even heat distribution. It measures 4 x 14 x 2 inches. 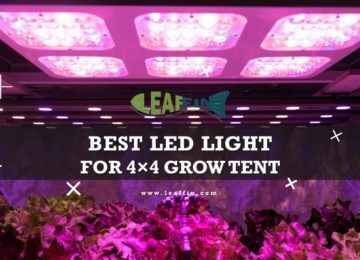 It’s available in 5 different watts (50 / 100 / 150 / 200 / 250), and the 250W version can handle raising the temperature 15° F above room temperature in a 90-gallon tank. It’s easy enough to install, but you’ll need to follow the directions in the setup guide. The temperature is in Fahrenheit, and you’ll just need to set this horizontally so that you can see the temperature setting. There’s also an indicator light. Its lifetime warranty is a huge bonus, especially when considering how fussy heaters can be. This is very reassuring and you will never have to worry about a faulty heater again. Electrical thermostat automatically turns itself off if the heater is not in water, and resets itself to resume working when placed back into the water. The device can be placed vertically or horizontally inside the fish tank. Has a large control knob which allows you to easily modify the temperature. Clear monitor light – Red for heating and green to let you know that the aquarium has reached the set temperature. Aqueon has confidence in the quality of their Pro Heaters, evident by providing a lifetime warranty. They’re available from 50 watts to 250 watts. Temperture reading is only in Fahrenheit as compared to other (except Eheim that only show celsius) that show reading in both celsius and fahrenheit. Eheim Jager heaters feature an automatic dry run shut off, precise temperature control and temperature recalibration capabilities. The EHEIM Jager Aquarium Heater is constructed from shock resistant and shatter proof glass for fresh or marine water. The glass is heavy for extra strength and the power cord has an industrial feel to it. Available in sizes from 25 to 300 watts (25 / 50 / 75 / 125 / 150 / 300). Both of the Eheim and the Aqueon have very attractive features. This heater has a 3-year warranty, while the Aqueon has a lifetime warranty. Also, this heater is made with glass as opposed to Aqueon’s aluminum. Despite that, it seemed that the Eheim had better features when it came to even temp control and easy to access and read thermostat controls. Widest Range of heaters in watts: If you need 75 or 125-watt heater, There is no other option. Precise temperature regulation by TruTemp dial recalibration. The TruTemp dial stays within 0.5 of your desired temperature. It’s very long, and it may be difficult to set horizontally. It’s very powerful and easy to set up. Temperature settings are quite accurate. Easy enough to adjust the temperature settings, and the display for the temperature setting is highly visible. Durable and quite hardy, with many other people saying that it has worked for them for over 4years. It’s very affordable and low priced. Only 1 Year Warranty: Lowest among all heaters in list. Even though that’s a lot better than some pet stores offer (some of that offer only 15-day warranties) other companies offer a longer time frame. 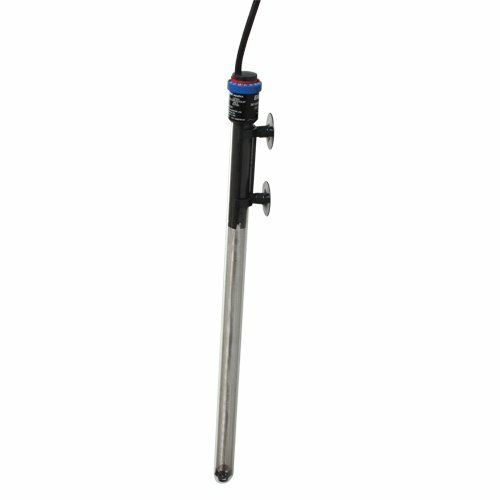 The Whisper and HT model submersible heaters by Tetra are designed specifically for heating small aquariums of 2 to 30 gallons in size. Both models are durable and simple to operate, especially the HT units because they have an electronic thermostat that automatically adjusts heat output to keep the water at a constant 78°F. All you have to do is put it in the aquarium and plug it in! 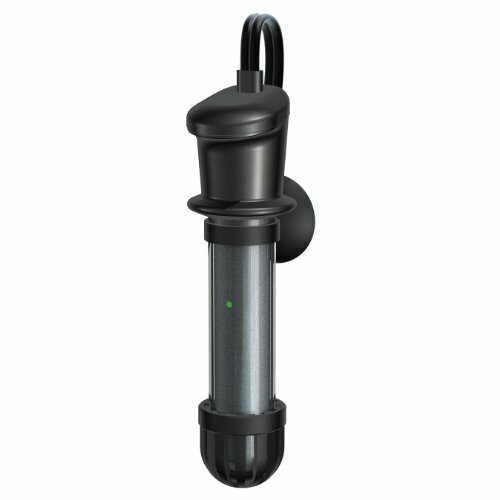 If you need to heat a mini or nano reef tank, one of these Tetra heaters would be ideal. Available in 50, 100, and 200 watts. All Tetra HT heaters have indicator lights to let you know when the heater is on. It will be red when heating and green when the proper temperature has been reached. Have a built-in electronic thermostat to automatically maintain water at 78° F which is ideal for most tropical fish. Can be installed vertically or horizontally. Its small footprint makes it easy to conceal behind plants or another décor. No Dry-Safety. So avoid pluging heater into an electrical outlet until it is placed inside the aquarium. 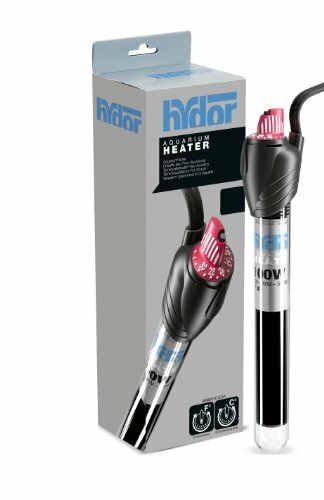 The Theo Heater works with a heating technology patented by Hydor. The heating element is made of a special polymer that has been silk printed with special ink, the ink heats up with the passing of electric current, and the heat is transferred to the water. Other features include special shatterproof glass, a precise temperature setting knob that clicks in 1°F increments, an on/off indicator lamp, and it switches itself off if the heater is not fully submersed to prevent overheating and damage. Here are some important features you must consider when choosing the best heater for your aquarium. The wattage/power of the heater is its capacity to heat and maintain the desired temperature range in your aquarium. The general rule of thumb is that you need 2.5 – 4 watts per gallon of water. Most aquarium heaters range from 25 watts to 300 watts. Larger aquariums require larger heaters. A 10-gallon tank typically needs a 25 - 50-watt heater. The 100 Watts heater is suitable for tanks up to 30 gallons. A 200 Watts heater is ideal for aquariums up to 65 gallons. The 75-gallon aquarium will require heater size having 250 to 300 watts. 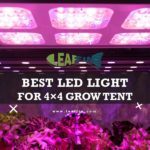 [/su_note]For a larger aquarium, the best practice is to use multiple heaters instead of a single one following the same wattage/gallon rule. There are several types of heaters available today. 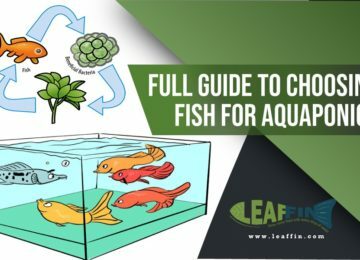 They all work differently and you need to know which one is suitable for your fish tank. Here is the list of heaters types to make up your mind. 1. Submersible Heaters: These most commonly used and durable heaters are placed right in the water. You need to ensure enough space around the heater for your fish to move around freely. These heaters shouldn’t touch the gravel because the difference in heat conductivity can crack the glass. They are generally more efficient as compared to immersible hanging heaters. 2. Immersible Heaters: These heaters are usually hung over the tank with the glass tube that houses the heating element is immersed in water. The aquarium hood needs an opening to accommodate this. The immersible heater can electrocute your fish and even start a fire, if not properly secured. This heater is not recommended for use in marine or brackish fish tanks as it can lead to corrosion in heater tube. 3. In-Line Heaters: These external heaters are placed in the line between the tank itself and the filter or sump. They are a great option for larger aquariums and prevent contact between fish and the heater. 4. In-Sump Heaters: They are placed in the sump and are also easier to maintain. They need more room and offer the same benefits as in-line heaters. 5. Substrate Heaters: These uncommon heaters usually consist of heating wires that are buried underneath the gravel. They are ideal for plant fish tanks, where the gravel keeps the plant roots too cool. You must be able to adjust the temperature settings on your heater. If you need to change the temperature for any reason, it becomes impossible with the heaters come with a set temperature. You will find an adjustable dial with each heater to preset the temperature for the aquarium. 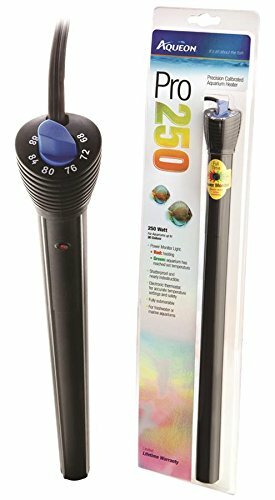 Look for the aquarium heaters having an adjustable temperature with a large control knob that is easy to grab and twist when submerged. 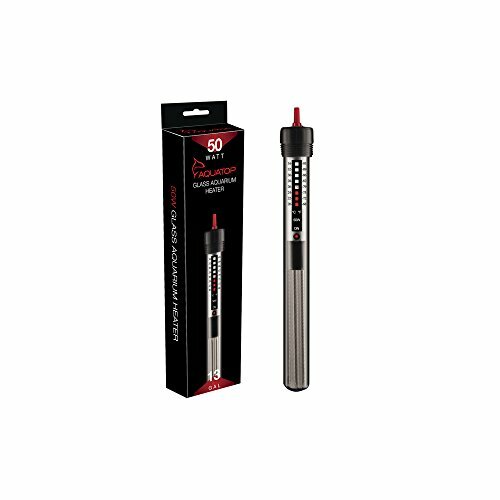 The thermometer or temperature scale helps to ensure the water temperatures within a certain range. Some heaters have Fahrenheit scales, others have celsius scale and some have both. You may want a visible reading in your desirable scale. This reading in most heaters may not always be accurate, it’s good practice to have a thermometer as well. You may desire automatic shut off feature in the heater that turns it off when the water level gets too low, or the temperature of your tank gets too high. Another great feature to have in the heater is the light indicator that tells when the heater is on and actually heating. These security features provide peace of mind and prevent dangerous cold drops and overheating. You always have to consider the aquarium type you have before choosing your heater. The manufacturer usually gives more information in the description regarding where you can use the aquarium heater. There are usually different heaters for saltwater, freshwater aquarium, turtle, betta tanks, and reef tanks. A heater will stay on and operating almost always. The electricity cost directly relates to the heating requirement that will add up to your electricity bill. 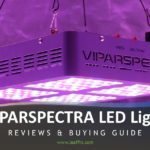 I'll discuss some choices to make for an efficient aquarium heater. Use two heaters instead of a single larger heater. Low output heaters are also more efficient and longer lasting than high output heaters. Use a fully-submersible heater. Floating immersible heaters are less efficient. A larger tank placed in a cold room requires the most energy to maintain temperature. Use insulation and cool-water fish to curb the heating cost. You should know the optimum temperature required for your fish. Choose a heater rated for slightly higher capacity than your aquarium to be in the safer side. But be careful about the choice as a 100-watt heater would be over-kill for a 10-gallon tank. If possible, use multiple heaters. Keep the heater close to the water flow (outlet or inlet from the filter). This makes it easy for the heat to disperse easily throughout the water in the aquarium. An aeration stone placed under the heater also help to circulate cold water to the heater and disperse warmer water. To minimize your heating cost, consider where you keep your aquarium. The aquarium will need less heating if it is already kept in a well-heated room. You can also minimize heat loss by using polystyrene or any other insulation material underneath the aquarium and between the aquarium outer wall and room walls. 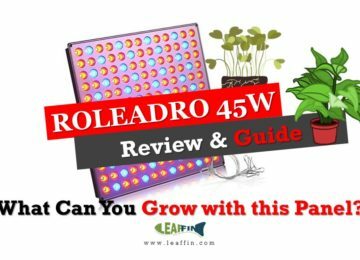 Roleadro 45W Review: How Efficient are These Cheap Grow Light Panels?